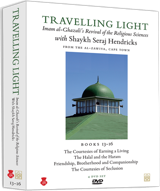 Synopsis: Imam Al-Ghazali (d.1111), most celebrated for his Revival of the Religious Sciences (Ihya’ Ulum al-Din), a compendium of spiritual guidance which he wrote to revive the flagging fortunes of the Islamic world in his age. This set of DVDs introduces four of the most important of the forty ‘books’ which comprise this massive work. They relate to ‘Saving Practices’ (munjiyat) which are in Book 31 on Repentance (al-Tawba), in Book 32 on Patience and Gratitude (al-Sabr wa’l-Shukr), in Book 33 on Fear and Hope (al-Khawf wa’l-Raja’) and in Book 34 on Poverty and Renunciation (al-Faqr wa’l-Zuhd).